We live in a world where we encounter people speaking different languages. Roughly about 5000 to 6000 languages are spoken all across the world, so it is essential to translate your site if large amount of your audience comes from a specific region speaking different native language. Even though, the majority of the world understands English, but what about those who don’t? Often we visit sites that are in Russian, French or even Arabic. In that situation, we simply use Google Translate as a tool to polish and translate the whole site into our native language for example English. It may not provide better results, but it would certainly better than nothing. 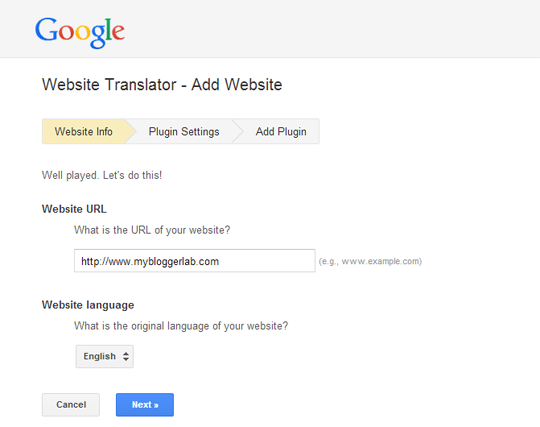 In this article, we will show you How to Add a Google Translate Button in Blogger. The first thing you need to do is to open Google Translate management page, and click on the big blue "Add to your website now" button. (Be sure, you are logged into your Google account otherwise you have to login to see the functions as it can be seen in the screenshot below). Now you have to insert your website details on which you want to install the Google Translate. Add your website url i.e. http://www.mybloggerlab.com. From the drop down menu, select the original language of your site (Note: By default English is selected). 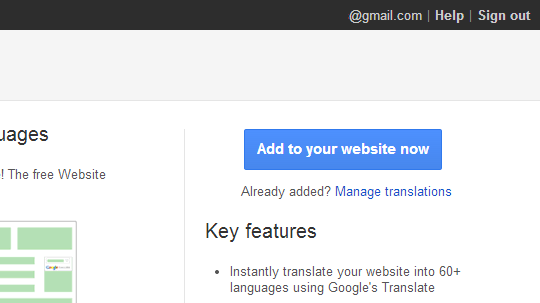 You can now customize your Google Translate button to suite your website design. There are a few designing options like vertical, horizontal or drop-down only display mode, you can specify a language or you can choose all languages to translate (we will prefer you to select “all languages”). Once you are done with customization and setting press “Get Code” button at the bottom. You will now see two kinds of codes the first code verifies your customized translate button, and the second one helps you to display the translate button anywhere in your site. Copy the first code and go to Blogger >> Template >> Edit HTML >> Search for </head>, and just above it paste the code which you copied. Once done, Save the template and move to the next step. We hope this tutorial may have helped you in learning How to add a Google translate button in Blogger. You can also use Bloggers built-in Translate widget incase you are not good with the coding. 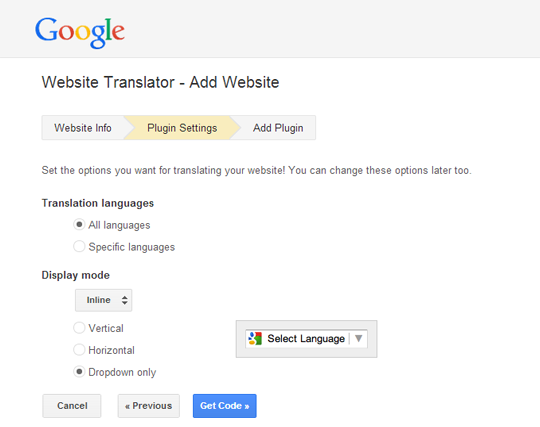 How many of you are using Google translate button on your site? Let us have a meaningful conversation and give maximum benefits to each other. Hey, Syed. Really starting to like your stuff. I really want to ask, can I please become a partner with you on mybloggerlab. I REALLY would appreciate it, if you allow me. Please ! Can you please tell where you are facing the error?